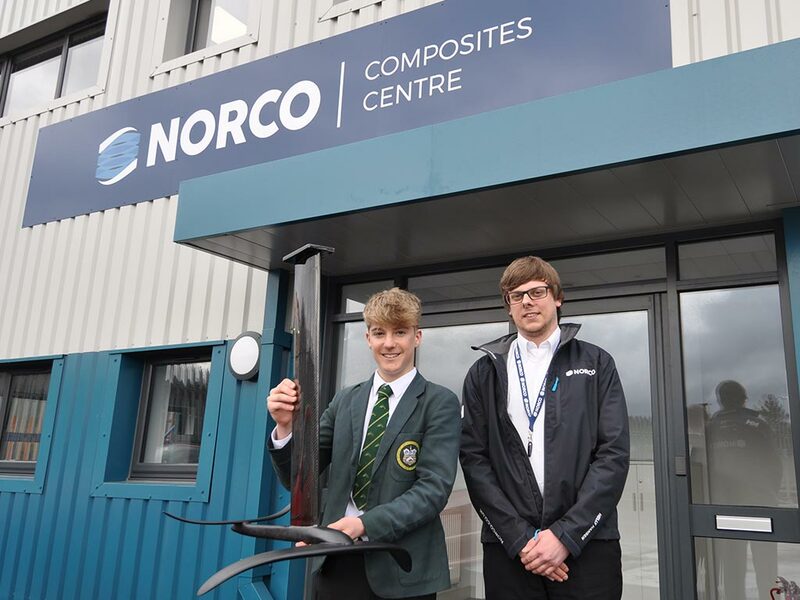 George Vincent, a student of local Poole Grammar school, approached NORCO to assist him with his GCSE technology project. 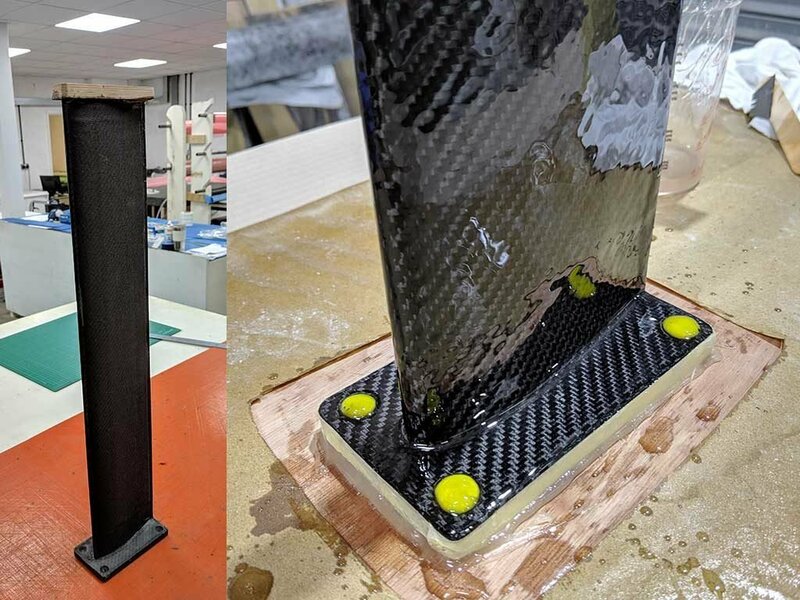 George wanted to manufacture a composite Hydrofoil and understand the differences between Carbon fibre and Glass fibre construction and was lucky enough to have one of the UK’s largest composites manufacturer on his door step. 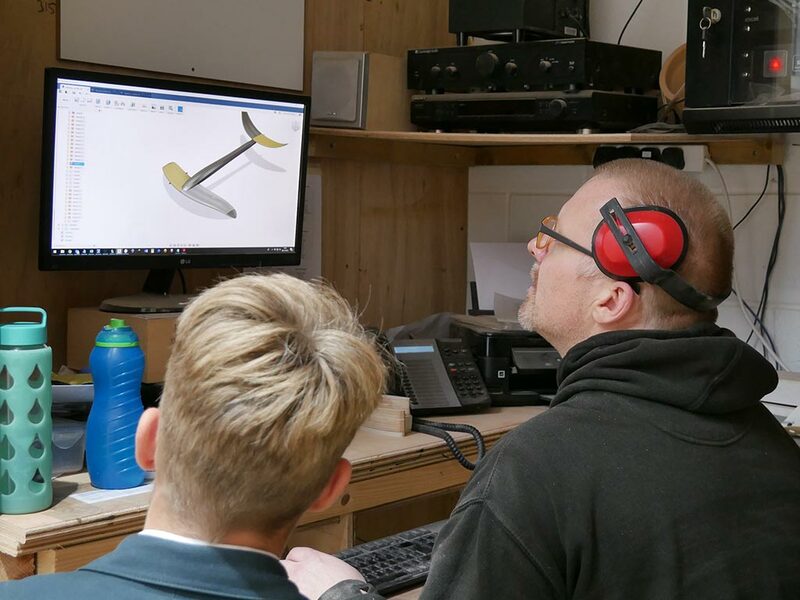 We were happy to help George realise his hydrofoil concept by utilising our composites process knowledge and facility capabilities. 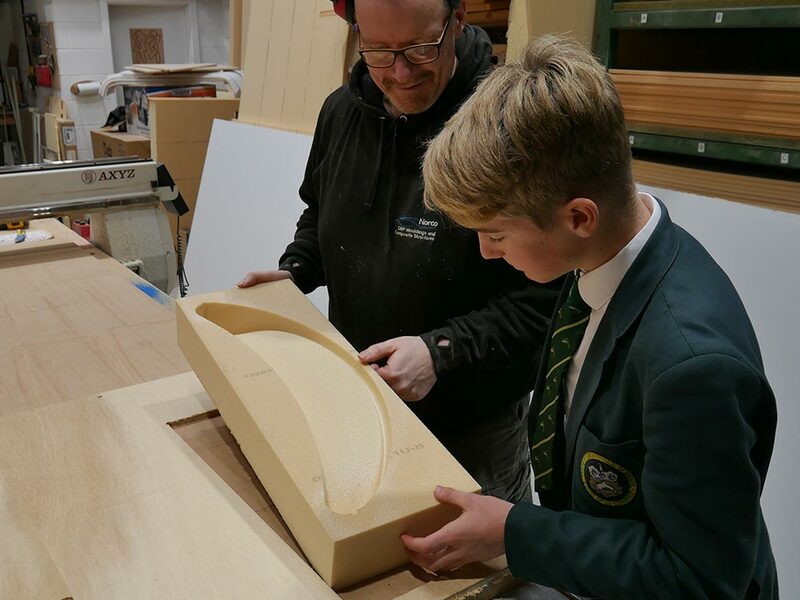 The first stage of the process was to interrogate the CAD model and work out a laminate thickness so that the surface could be offset from the outer surface (A-surface). 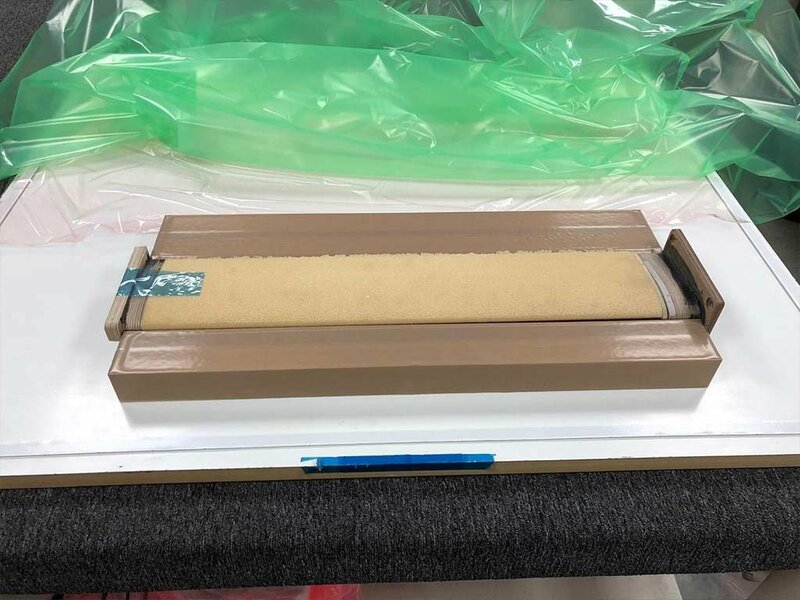 This process is critical when using a foam core on a single stage cure with complex geometries to ensure the composite laminate is being compressed by the foam core. 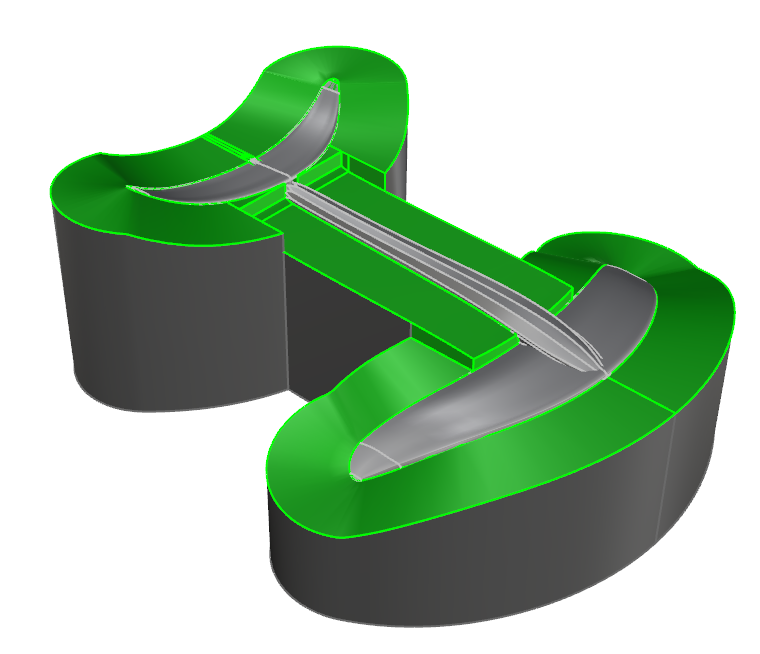 The A-surface is then extracted from the model and used to design a mould tool. 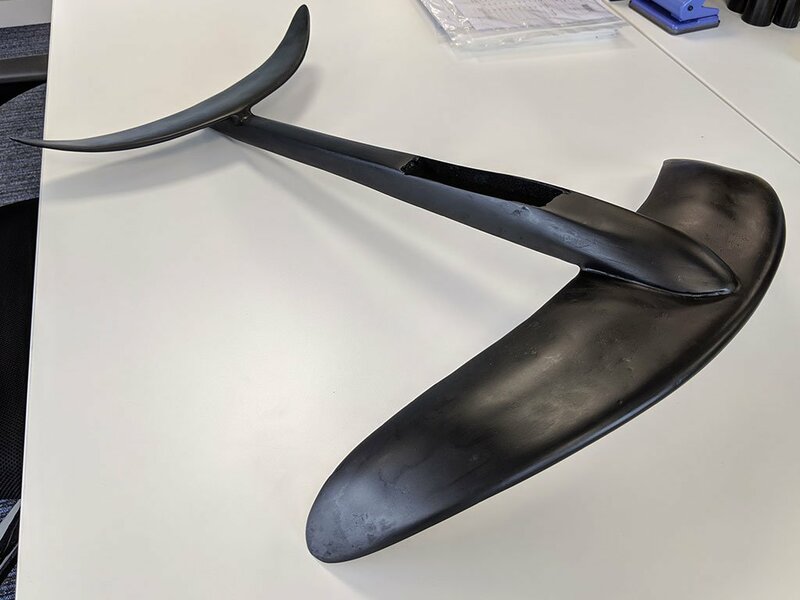 For this one-off prototype it was decided that a machined high-density foam core mould could be used to produce the required level of finish and accuracy. Once the CAD designs were signed off the machine shop produced tool paths and machined the foam core mould tools and the foam core implants for the parts. 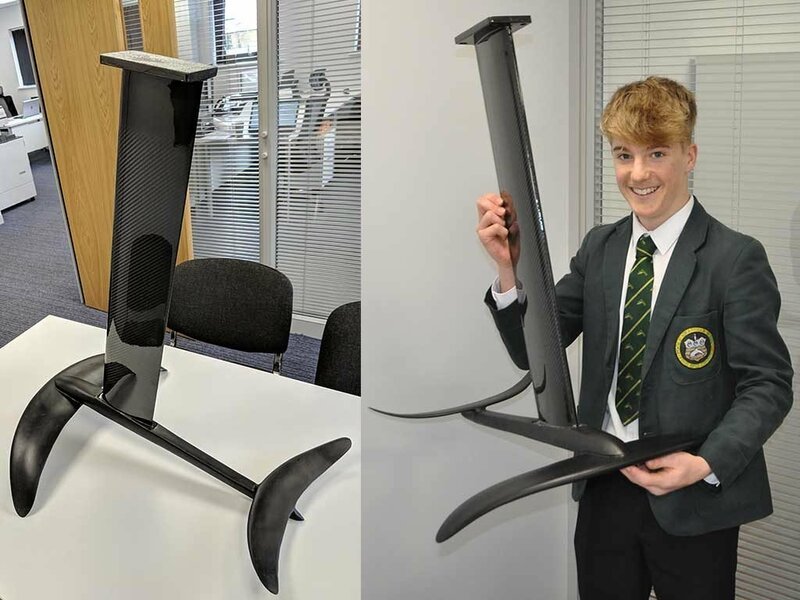 To give George a better understanding of processing differences between carbon fibre prepreg construction and GRP wet lay it was decided that the Boom arm would be manufactured from Carbon fibre and the hydrofoil from GRP. The boom arm mould tool was first hand finished to smooth off any machining marks and then covered using a PTFE coated scrim to provide a smooth self-releasing finish. The foam core and plywood inserts were then assembled and bonded together using a suitable epoxy adhesive. Once cured and hand finished the implant was wrapped in carbon fibre using a mix of woven and UD fabrics to ensure sufficient stiffness. The wrapped core was then re-positioned into the mould tool bagged up and cured in an oven. 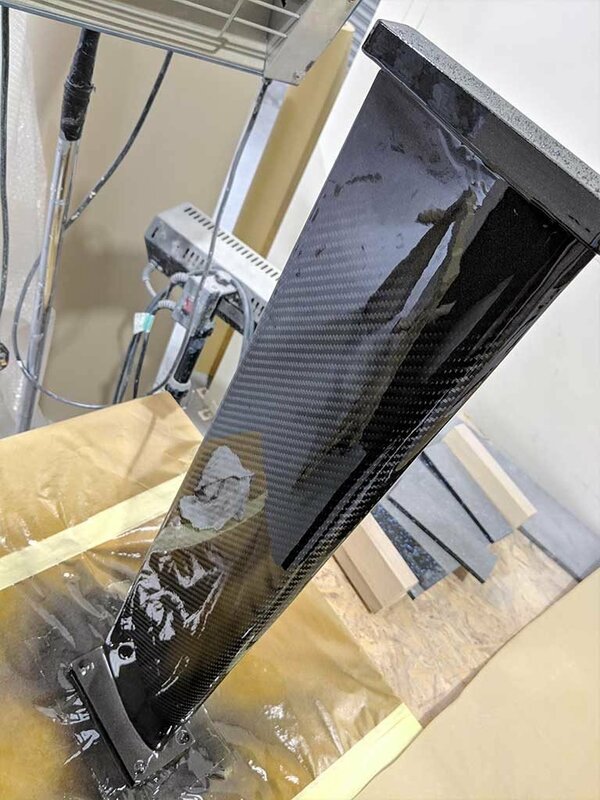 To reduce the chance of burn through into the carbon fibre during preparation for the lacquer a prepreg peel ply was added before curing which is then removed leaving a keyed surface ready for the surface improvement resin wash. The cured carbon fibre part was then trimmed and lightly hand finished before being sent down to the paint shop. The resin wash ensures that the surface can be sanded to a smooth finish without sanding into the carbon fibres which would detract from the visual carbon appearance. 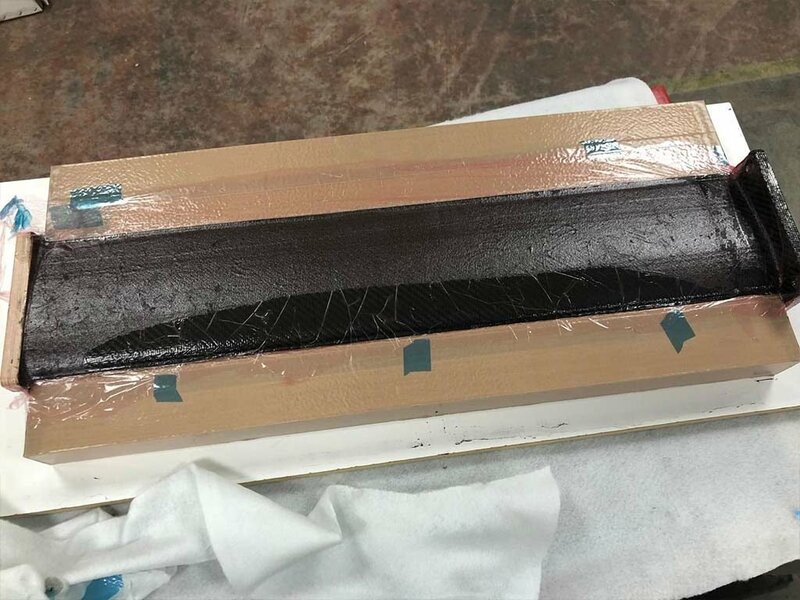 Once the resin wash had been prepared the lacquering process was completed. This consisted of a clear primer coat and clear top coat. The topcoat is then cut and polished to leave a high gloss finish. The hydrofoil was manufactured using GRP construction with the same foam core as the boom arm. The hydrofoil foam core was machined in 3 parts which were then wrapped using hand laminating with glass CSM and Vinylester resin. 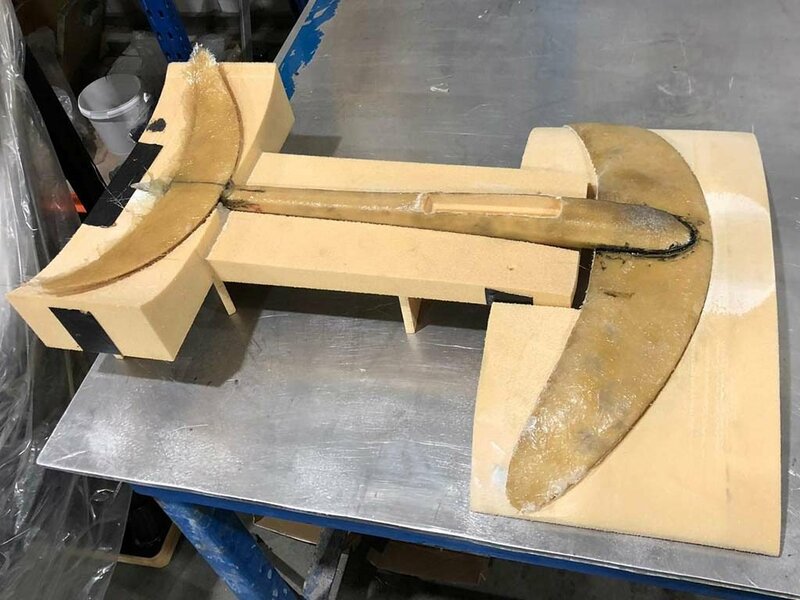 The 3 parts were individually wrapped before being bonded together in the machined foam core assembly jig and over laminated for a strong joint. 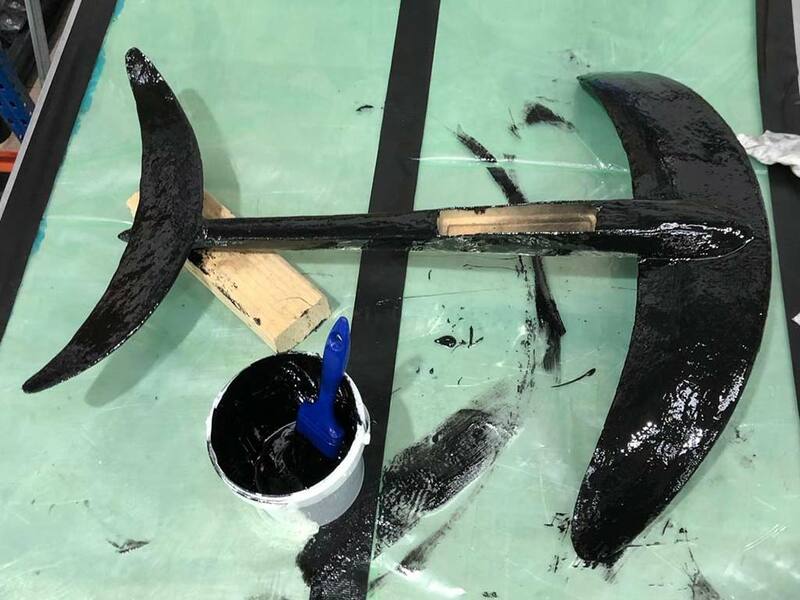 The hydrofoil was then trimmed to remove any sharp edges before being keyed and flow coated to provide a fairing layer to create a smooth finish. The gelcoat was sanded to a smooth finish with any small voids or low points filled before the paint was applied. The boom arm was then bonded into the hydrofoil to finish the assembly.